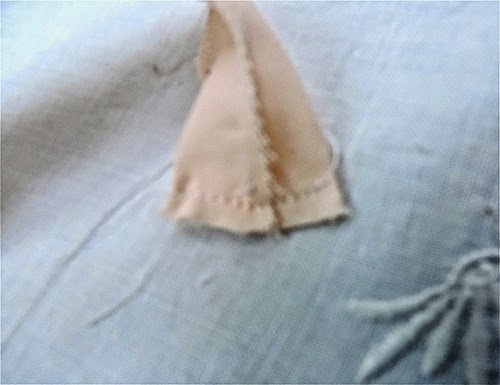 B – Flesh coloured fabric (cotton recommended). C – Hemostats – one pair of about 5″ and a longer pair would be useful. 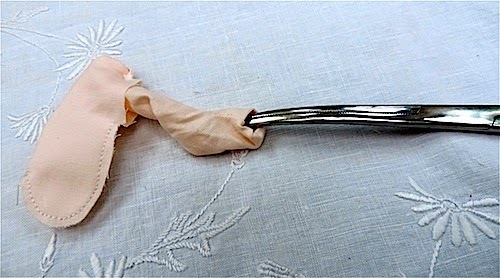 D – Scissors for paper and fabric. F – A hand sewing needle. 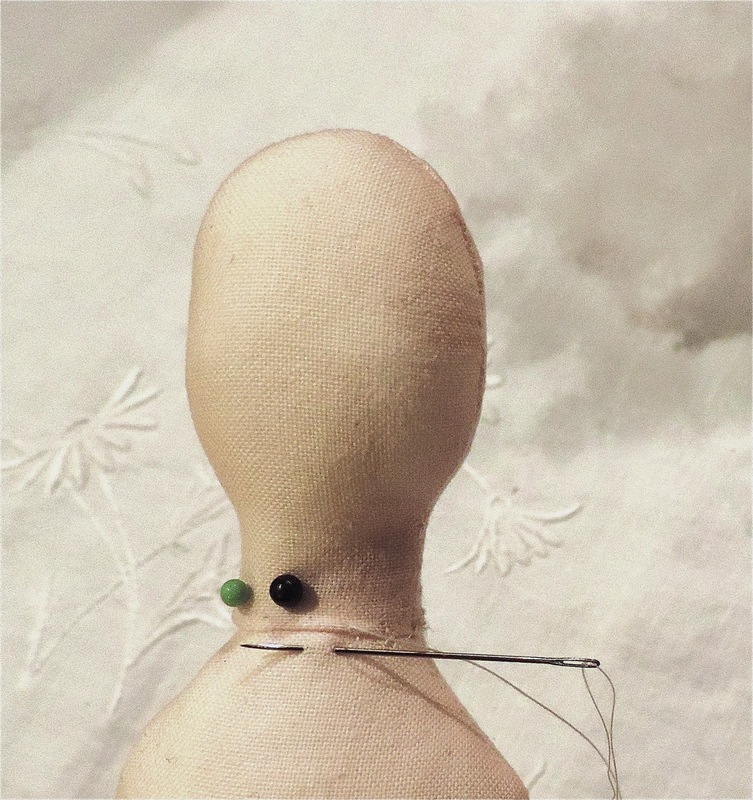 G – A longish darning needle or doll needle. H – Very strong thread/yarn for jointing. 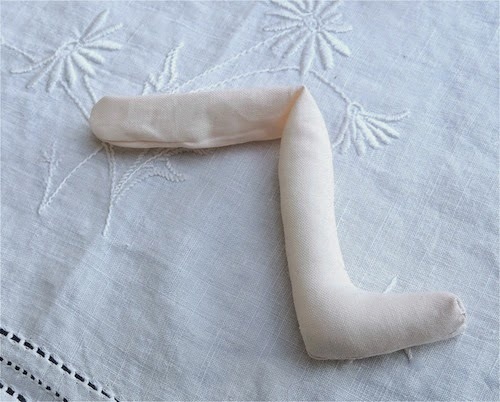 I – Pencil or vanishing fabric marker. 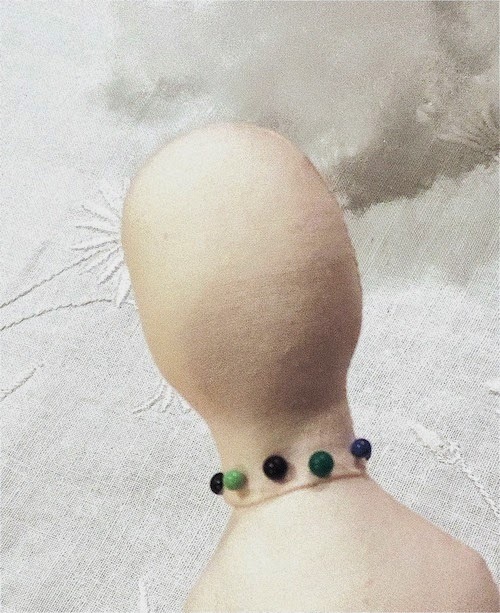 L – Pins (glass/bead head recommended). A Sewing Machine (not shown). 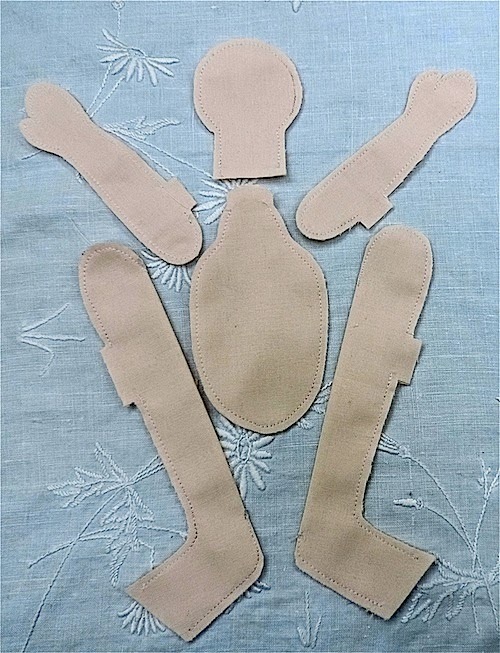 Applique foot or open toe sewing machine foot (not shown). 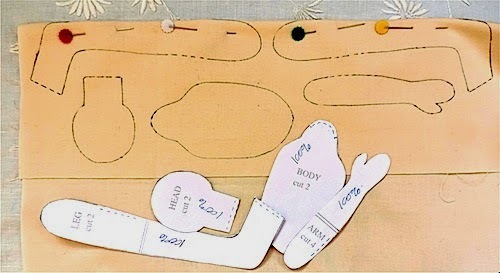 If you are not using my pattern, skip this section (in blue) and go straight to ‘MAKING YOUR DOLL’. 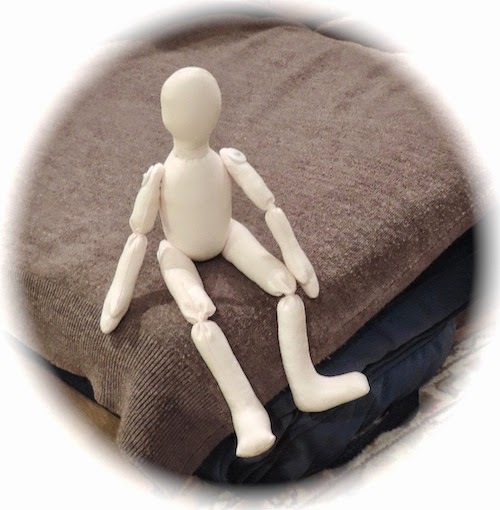 First decide what size doll you wish to make and print your pattern sheet to the appropriate scale. On your printer select: Scale 100% or ‘Scaling None’ to make a 10″ doll. If you want to make your doll another size adjust your printing scale. 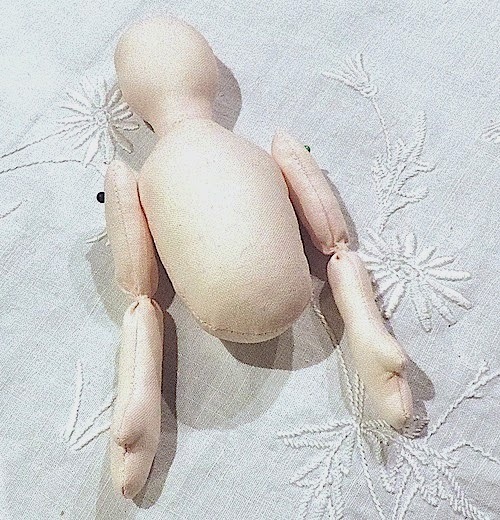 For example, choose ‘Scale 90%’ to make a 9″ doll, ‘Scale 80%’ to make an 8″ doll, ‘Scale 70%’ to make a 7″ doll and so on. 1. 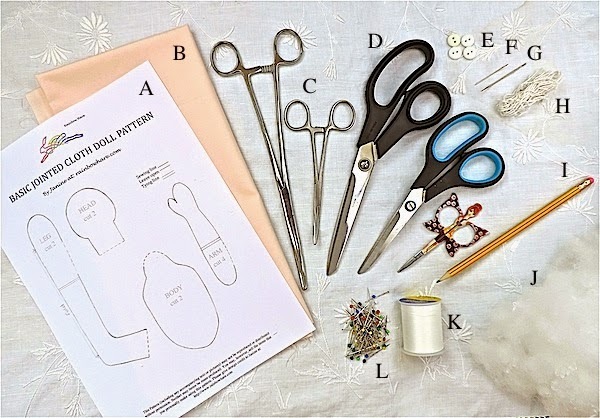 Cut out your pattern pieces using paper scissors. 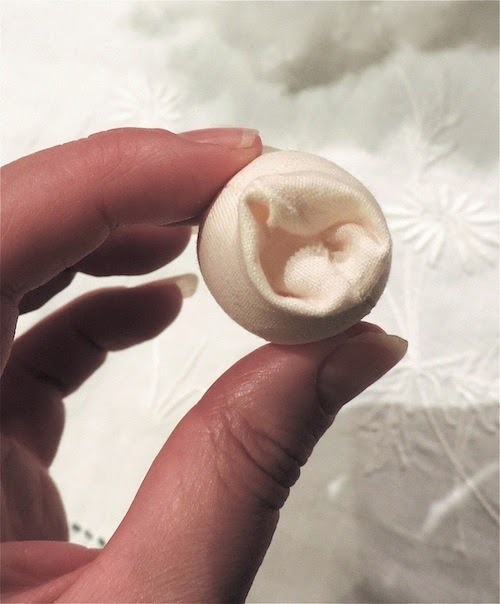 If you are making more than one size of doll. it is helpful to write the scale on your pattern pieces. 2. Fold your fabric in half and lay your pattern pieces on your fabric. 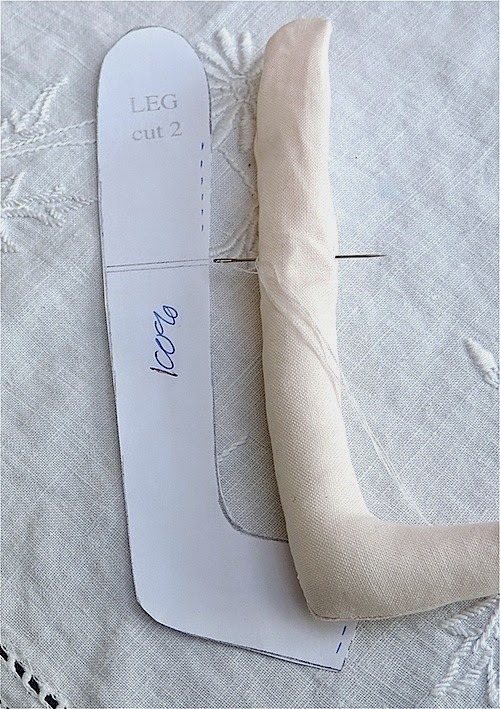 If you have pieces with a straight line on one edge, such as the leg pieces below, place them against the fold in your fabric, as shown. Leave a generous 1/2″ minimum between your pattern pieces. 3. 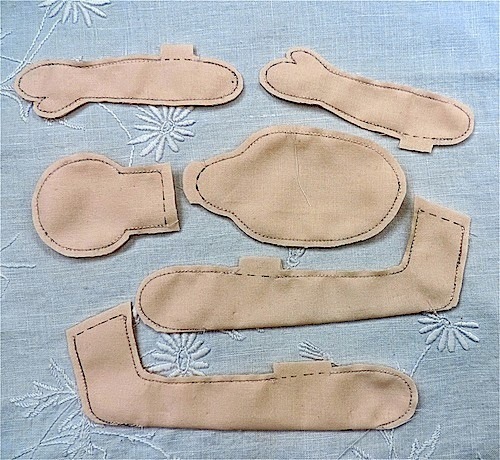 For any body parts that require two identical pieces to be sewn together, draw around the SEWING LINE on your pattern pieces using a pencil or a vanishing pen marking where you need to leave openings for turning. 4. Sew over your pencil/pen markings on the SEWING LINE only. Use a short stitch length (1 1/2 – 2 recommended) and reverse stitch at the beginning and end of each line. Take care to sew on the line. 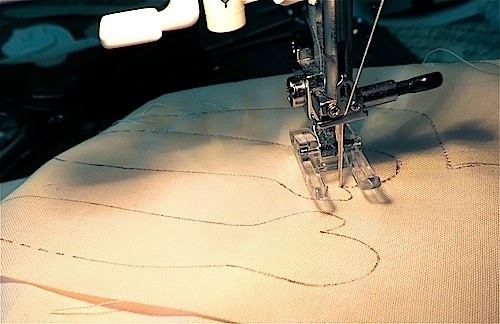 On the tighter curves, you may find it helps to shorten your stitch length and sew very slowly. 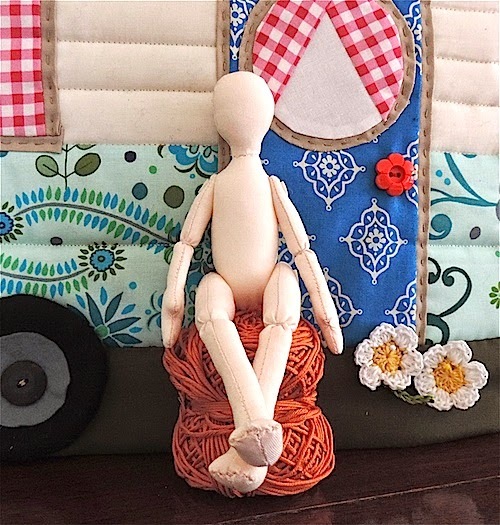 An open toe foot is extremely useful because with most feet it is hard to see where you are sewing clearly enough, especially on the smaller scale dolls. 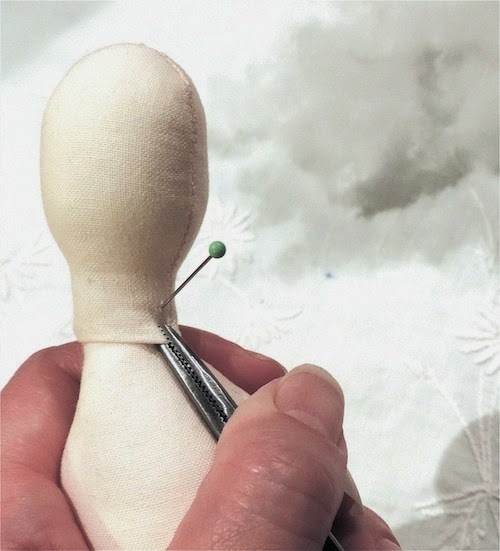 When you reach the point between the thumb and the palm of the hand, leave your needle down, raise your presser foot and pivot your fabric. 5. Cut out your pieces. 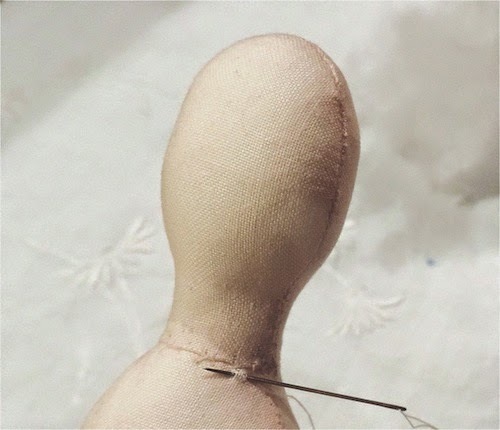 Cut approx 1/8″ from your SEWING LINE or 1/4″ if you are intending your doll to be a child’s toy. Cut 1/4″-1/2″ away from your dotted lines – the places you have left open. If you have used a vanishing marker vanish your lines after cutting out. 6. Align the seams on the top and bottom of each foot and pin. Sew across the foot in a slight curve, as shown. 8. Stuff the body very firmly. You will probably be surprised at how much stuffing this takes! To avoid lumpiness, use your hemostats and feed your stuffing into the piece in a single long line. 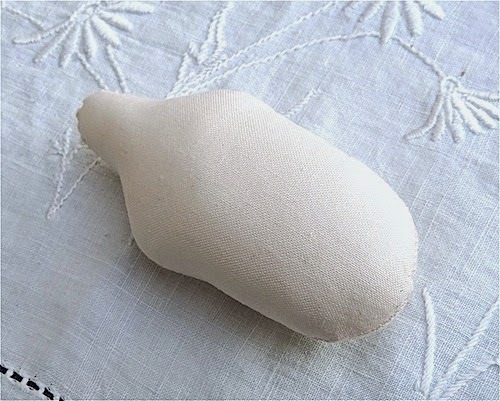 Keep stuffing until the body and neck stump are as full as possible. This piece needs to be very firm for the button joints to work well. Hand sew across the neck stump opening. 9. Stuff the head very firmly (as in step 8, above) and stuff the neck lightly. 10. Turn under approximately half of the neck edge (the actual measurement will vary depending on what size doll you are making). 11. Pull the neck over the neck stump as far as possible and pin. This is tricky to start with but gets easier as you proceed. You may need to go around the neck several time pulling the neck edge down tighter with your hemostats and repositioning the pins. 12. Slip stitch the neck edge onto the neck stump turning the neck edge under as you go. Your stitches will pull the neck down. 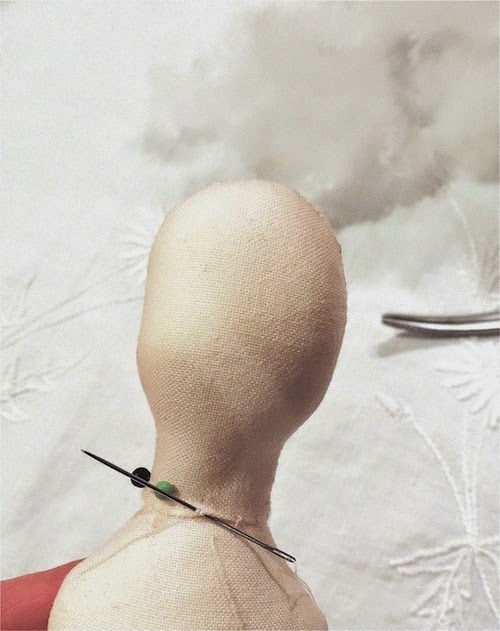 If the head doesn’t feel completely secure use your hemostats to add more stuffing before you complete your slip stitching. I recommend you then slip stitch or ladder stitch round another time to pull the head down a little further. 13. Now move onto the arms and legs. Stuff the hands and feet reasonably firmly. Stuff the lower arms and legs less firmly, stopping before your tying lines. Take care to stuff each limb the same amount as its partner. 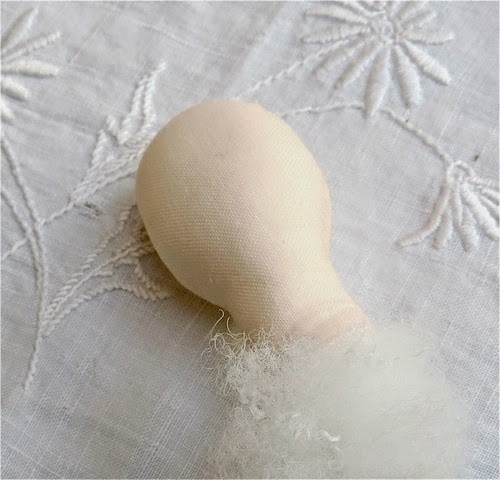 The place to stop stuffing will vary depending on the size of your doll. Use your pattern pieces as a guide to position the tying lines. If you hold the limb at the tying line the lower limb should be able to swing freely, as shown. 14. 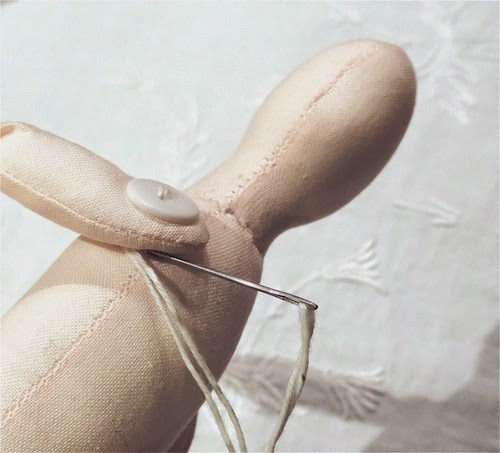 To make the elbow and knee joints, secure a piece of strong thread to the back of the joint. take your needle through to the front of the joint and back again two or three times. 15. 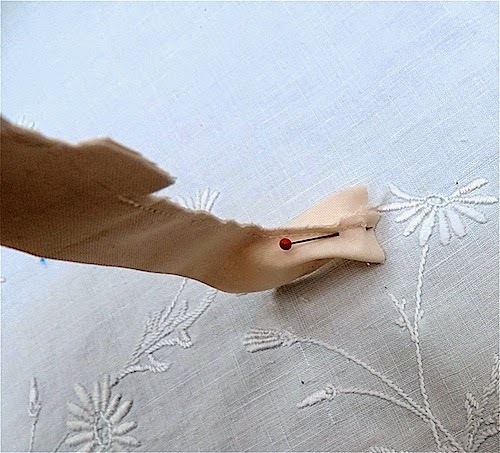 Wrap your thread around the joint two or three times and fasten off. 16. Stuff the tops of your arm and leg pieces. Stuff very firmly at the top (shoulders/hips) and less firmly as you work down towards the elbows and knees. 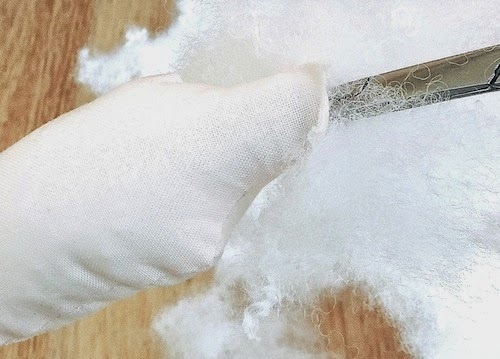 Stop stuffing before the joint stops moving freely. 17. Slip stitch the openings closed. 18. Secure the arms to the upper body using buttons and strong thread. Draw thread through button. arm, body, arm, button. Work back and forth several times. 19. 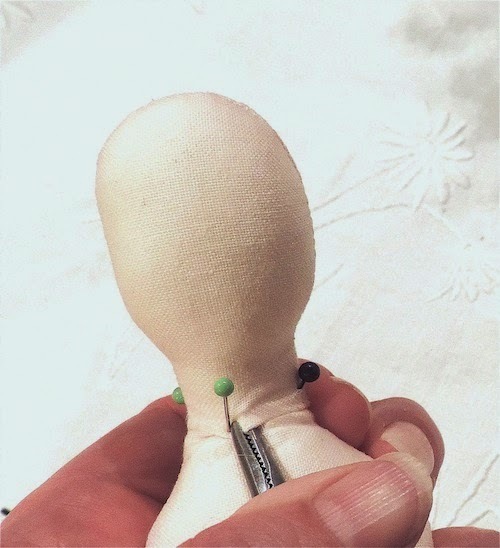 Secure the legs to the lower body using buttons and strong thread in the same way that you joined the arms. 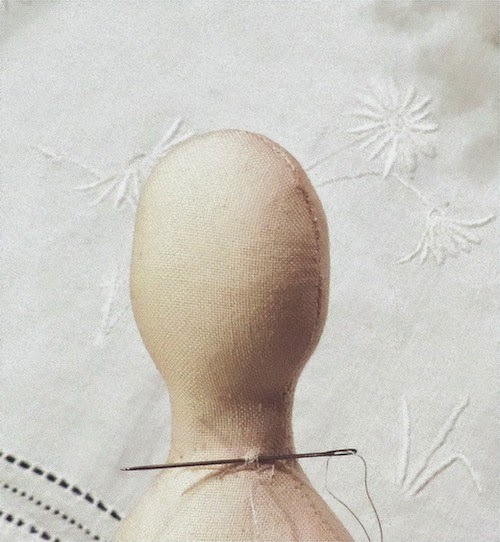 Your doll is now ready for you to add a hairstyle and dress, as desired. Hi, Disne, I’m sorry the youtube video seems to be no longer available. 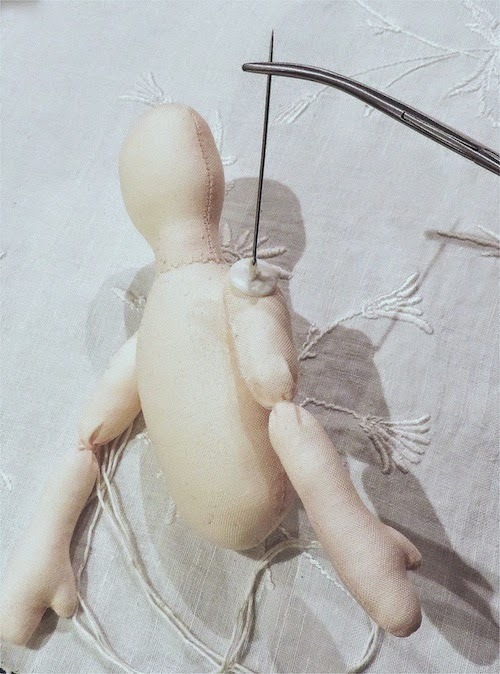 The main points were to stretch the stuffing into a line and feed it into the doll in a continuous piece – not to push in one piece then another – and to stuff firmly. The lady in the tute used a stuffing fork but I use haemostats. I think wrinkles come from having too little stuffing in that area. If I make the head and body separately (like in my tute) when I sew the head to the body, I sew part way and keep adding more stuffing. Then I sew around another time about 1/4″ from my first round of sewing using a ladder stitch and pulling tightly, Janine. This was great, just what I was looking for, thank you. Have you ever put the button between the arm and the body? Do you think it would work? I wondered if you could do one where the buttons wouldn’t “show”? So that's how you make them!! Great tutorial! The possibilities are endless with these, so cute! Amazing tutorial. 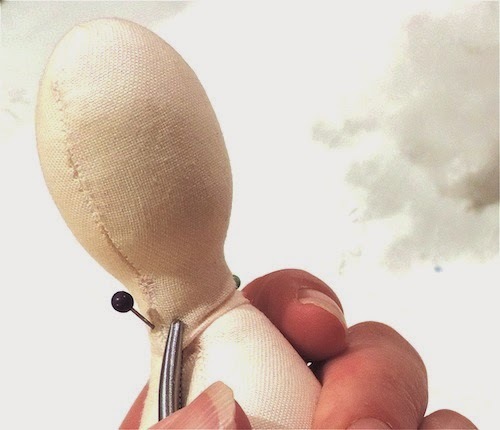 You have thought of everything to simplify the making process of your cute as cute dolls! 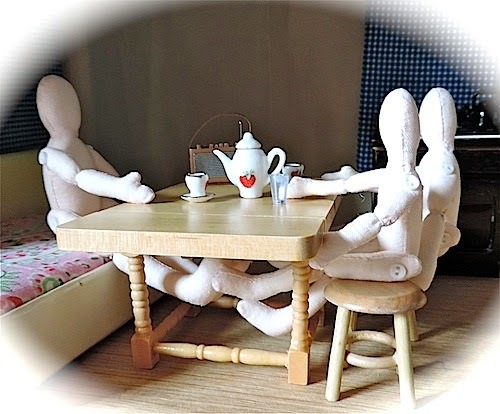 I had never heard of hemostats either…..they certainly do seem to make tiny doll making so much easier! Thank you for sharing all the little details, Janine! So very interesting, all of those little pieces, I have tried turning small pieces and it is hard, I need to find a pair of hemostats! Thanks for making that seem far less scary than I expected! It may never happen, but I've added it to my “I want to try” list! 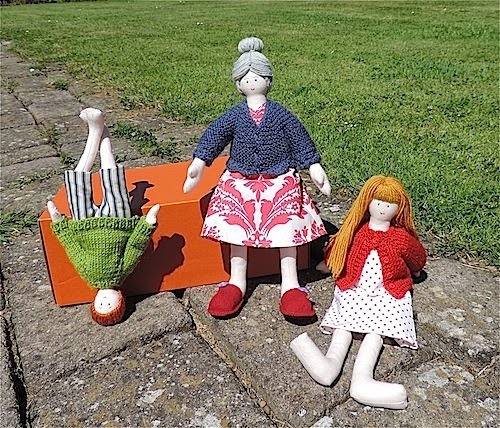 It looks like a lot of love goes into making these dolls. How fun to see how in the world you make these cutie pies! Thank you so very much for sharing all the details.